One of the odd things about blogging is that you never know what will be popular with visitors. Of course, you have the core base of followers who are interested in the main subject area of the blog (books, travel, adventure), and they do drop by whenever there is something that interests them. On the other hand, there are many visitors who drop by purely by chance, following a link from another site or a search for an obscure subject. So, on my recent visit to Los Angeles, I decided it was time to actually see the real culprit of this long-term mystery. 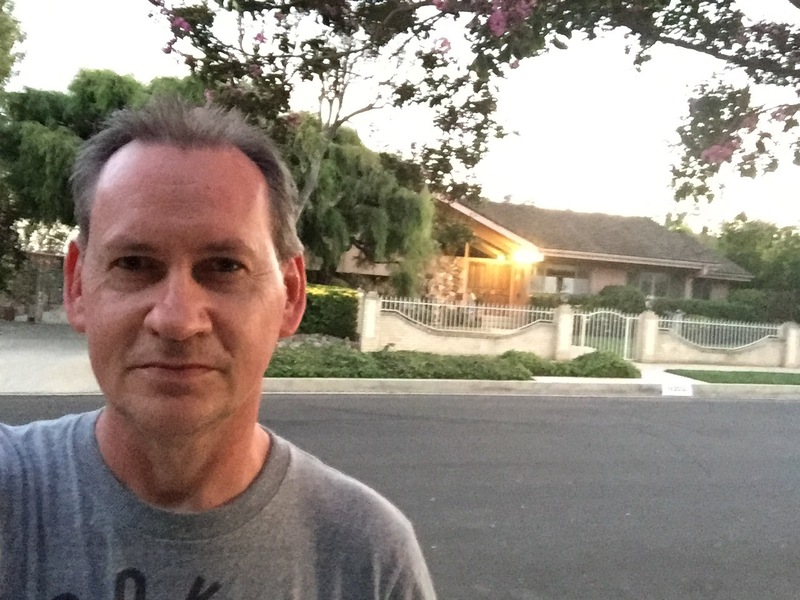 I was staying in an awesome retro-style hotel in North Hollywood (The Garland – it’s a brilliant boutique hotel with a unique retro Hollywood feel), and I was totally surprised when I found out that the original Brady Bunch house was located just a couple of blocks away on Dilling Street. OMG. What a hoot ! I knew I needed to go there. It was just a matter of fitting some time into my schedule to go for a walk and find it. I didn’t expect that seeing it in real life would solve the mystery I’d pondered since childhood, but it was more about seeing this piece of my childhood memories in the flesh, for real. I have to admit that I did feel a bit awkward, just standing across the street looking at a house like a crazed stalker, but I did stay long enough to grab a couple of photos as a new memory. The pics below show how it used to look and what it looks like now – complete with a bad shot of stalker-me on the scene. I also took the shaky amateurish video below, to show a wider view. Over the years the house has changed a bit. A new fence and new gardens, but nothing can take away the unmistakable pitched roof over the front doorway. The house and garden were in great condition and clearly looked after and loved by its current owners. I wonder how many fans (like me) they see wander past and stop to take an awkward photo. Does it annoy them? or do they relish the fact that they live somewhere so neat? I suppose it’s just part of the price of owning a piece of television history. 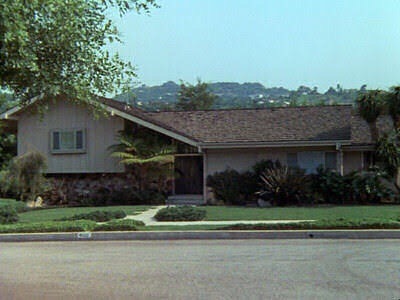 Standing there, stalking, and staring, it was easy to imagine the Bradys all sitting inside at the dining table, talking over each other while being served a fine buffet of food by Alice, or hopping around the backyard in potato sacks, or Marcia getting hit in the face by a ball. Some exterior scenes flashed before me as well, Tiger running across the front lawn, and Alice popping out the front door to get the newspaper for Mr. Brady to read over breakfast. Not everyone can say that they’ve been to Brady ground zero, but now I can. 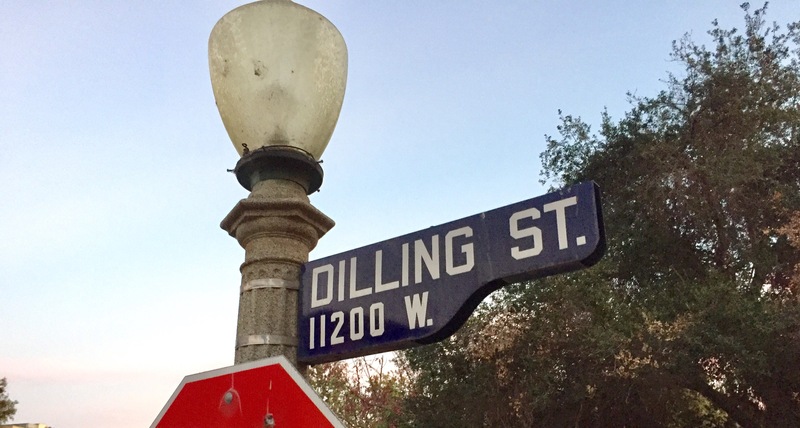 To the very Brady designed house on Dilling Street where the original modern family taught a generation some life lessons in a squeaky-clean, and quirky kind of way. LONG LIVE THE BRADYS. As a special treat for fans … here’s a classic Brady moment. OMG! 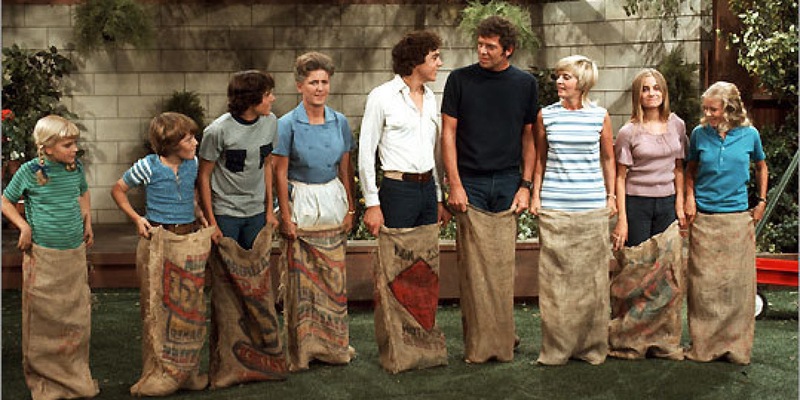 I grew up watching the Brady Bunch! I recall it was the first TV series to have the parents SHARE a bed together. Oh, the scandal! LOL! Visiting the Brady house must have been on your bucket list, Steve! Seemed like it didn’t disappoint. Love the original post! Cheers! Actually, Ozzie and Harriet were the first television couple to share a bed. This was only acceptable to the general public because they were actually married in real life. Thanks for sharing! Wonderful post. Old reruns are on TV Sundays in New York. I still watch it. My guess is that there is always a Brady on tv somewhere in the world. One of the best parts of my childhood was watching the Bradys live the dream. How cool that you found your way to the most wholesome home in America, even if it was only make believe. W-wait what!!! Of course the Bradys are real! Aren’t they? The first reality show and all that. I confess I’ve never seen the Brady Bunch and only know about them in an answer-a-trivia-question kind of way. But I think finding the house and stalking it is great! OMG. I’ve never met anyone who has never seen The Brady Bunch!!! I do know that the owners put up the fence because so many Brady fans would walk on their property to get photos. I really do wonder what the interior looks like. I read somewhere that it’s actually only two bedrooms. I guess it’s a bit like the TARDIS. Much bigger on the inside. I can imagine how annoying it would be with people always walking on the lawn. The downside of living in an icon.